The last week of November will be remembered for the program, commissioned by the Committee for External Relations of St. Petersburg in cooperation with the Committee for Culture. 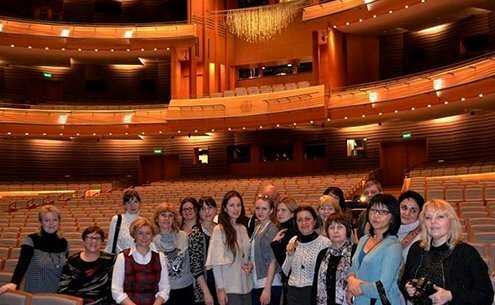 The event was attended by about 60 members of Russian expat community: teachers, scholar in culture studies, art historians, musicians and theater makers from 15 countries. The lecture program was drawn up by leading St. Petersburg experts: the Chairman of the Advisory Council on the Russian Foreign to the Committee for External Relations of St. Petersburg S.M. Nekrasov, Dr. of Historical Sciences Prof. E.V. Anisimov, and others. We provided transportation, information support, carried out the opening ceremony at the Rimsky-Korsakov St. Petersburg State Conservatory and the closing ceremony at the Rumyantsev Mansion. We were responsible for the invitation of lecturers and honorable guests, and sightseeing tours and provision of teaching materials, gifts, and souvenirs for participants.